﻿ Florentino Pérez: "You can't think of a Real Madrid without Cristiano Ronaldo"
11.09.2015 » Florentino Pérez: "You can't think of a Real Madrid without Ronaldo"
It's now been a 6-year run since Cristiano Ronaldo signed for Real Madrid and if there's anything no one can contest is the fact that the Portuguese star has always been a crucial element in the team. 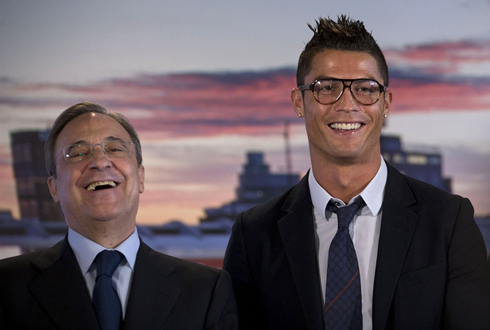 With 3 years left in his contract, Florentino Pérez believes Ronaldo will end up staying in Madrid until 2018. 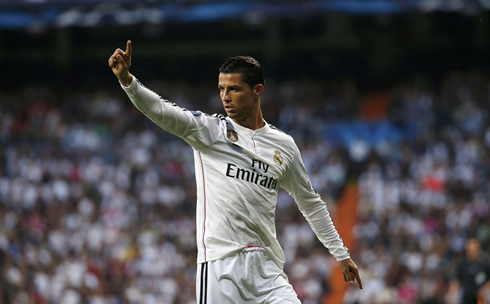 Cadena Cope: "Rumors say that PSG will keep coming after Cristiano Ronaldo. Do they have any chances of signing him?" Pérez: "Actually, it's all very simple. They only have to pay the exact fee in his release buyout clause [1 billion euros]. In the present day, it's impossible to think about a Real Madrid team without Cristiano Ronaldo. However and like Bernabéu said once, this is all part of a big equation. We don't even think about selling him now. He's the best player in the world", affirmed Florentino when defending the idea that Ronaldo still has important things to do in Madrid. Cadena Cope: "Do you like Lionel Messi?" Pérez: "Yes, of course. But I like Cristiano Ronaldo a lot more! ", instantly replied the man responsible for the "Galácticos" era in Madrid. Cadena Cope: "What do you think of Bale playing on the left wing?" Pérez: "In my time, left-footed people played on the left, but those are decisions I don't want to get involved in." Cadena Cope: "Real Madrid didn't sign any star this summer. Do you think this squad is still missing someone?" Pérez: "There wasn't anyone available in the market better than our current players. We already improved our team with Kovacic, Casemiro and Danilo. It's hard to manage everyone's ego when you got such a good group of players around you. If we had signed another #9, that would have upset a lot of people like Jesé or Isco. And Benítez was well aware of that..."
Cadena Cope: "Do you think Gareth Bale can reach Ronaldo's level since they were signed for a very similar value?" Pérez: "They are both great players, but we'll probably see clubs beating those transfer values right next summer. I don't know if we'll keep being the richest club in the world for too long either, since we're seeing a lot of powerful people investing their money in other clubs. I have a clear conscience though and I know that whenever I end up leaving Madrid, I'll leave the club in a very good situation. We have to keep pleasing our fans and followers around the world in order to keep growing and winning in the future", commented the 68-year old business man, who still has 2 years left in his mandate as Real Madrid president. 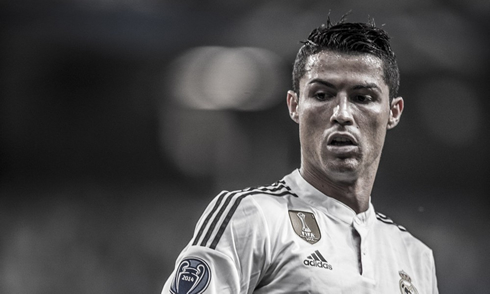 Cristiano Ronaldo next game will be for Real Madrid, on September 12 of 2015, against Espanyol. You can watch Juventus live stream, Espanyol vs Real Madrid, Atletico Madrid vs Barcelona, Manchester United vs Liverpool, Everton vs Chelsea, and Arsenal vs Stoke City, all matches provided from our live sports game pages.